In a suburb of Paris called Argenteuil, I see a stand like this outside the train station. I wonder, "What cute T-shirts are they selling?" When I approach, there are no T-shirts for sale, just a notice about the church in town, the Saint-Denys Basilica. When I ask the woman working the stand about what special thing is happening at the church -- are they selling T-shirts? -- she looks at me like I am a first rate, top-shelf idiot: "Madame, it's the tunic worn by Christ during the Passion." As a highly skeptical atheist of Jewish origins, you might not think this would interest me, but of course, by now you know that my goal is to experience everything possible while in France. Everything, it turns out, except hours-long lines. It's an unusual opportunity, as the Sainte Tunique du Christ, as it's known, is not usually on public display. But I think I'll leave the several hours of waiting to the devoted. The history of the shirt is, let's just say, vague at best. It is reputed to maybe, possibly have been the shirt, or a shirt, worn by Christ before or during (but wasn't he shirtless?) the crucifixion. It's also knows as the Cape of Baby Jesus, may have been worn by Mary, and may have been purchased by Ponce Pilate who resold it to Christians. The apostle Petter may have carried it with him out of Jerusalem, and it may have later been found by Helen, mother of the emperor Constantin in the 4th century. What is more known is that in the year 800, it was offered as a gift to Charlemagne, upon being named Emperor. It seems from there, it made its way to Argenteuil, where it was lost for a few hundred years till the mid 12th century after being hidden when the Vikings attacked. I didn't see any more than you did: the graphic design on the side of the stand. It is apparently a wool tunic, with a purple brown color, somewhat in tatters. I have a T-shirt that fits this description in the bag to give to Goodwill, but somehow I doubt it will become the subject of much devotion. Instead of photographing the shirt, I content myself with photographing the faithful (and more patient than I) who are waiting to see the shirt. This gets me to thinking about all the other holy relics in the area. Arguably the most famous reliquary -- and the largest in the world -- is Sainte Chapelle, built in the 13th century in the heart of Paris, commissioned by King Louis IX ("the Saint" and, less famously, as "the Arbiter of Europe" and "the Lieutenant of God on Earth") specifically to house his collection of relics, the most important of which was (is) Christ's Crown of Thorns. King Louis IX purchased the relics from the Latin Emperor at Constantinople for 135,000 livres. They arrived in Paris in August 1239, and for the final stages of the journey were carried by the pious, barefoot King, who was dressed for penitence. The relics were stored at the Cathedral of Notre Dame (where they are, once again, post-French Revolution) until the chapel was ready in 1248. This scene has been immortalized in one of the many gorgeous stained glass windows for which Sainte Chapelle is famous. The chest in which the crown is stored cost 100,000, and contains other relics, including what the faithful believe are fragments of the True Cross, a nail from the Passion, and the Holy Lance. As for the Crown of Thorns, from one research site I found, and I quote: "Despite numerous studies and historical and scientific research efforts, its authenticity cannot be certified." The relics are (in theory) stored at Notre Dame, but Sainte Chapelle is worth seeing simply for being a stunningly beautiful gothic church filled with color and stained glass. Saint Denis is a semi-hard goats' cheese made from raw milk in the Deux-Sèvres department in the Aquitaine-Limousin-Poitou-Charente regions. The wheel is aged for several months, during which time a thick, moldy, boulder-like crust develops. The cheese is mild -- mildly goaty, mildly sweet, and mildly rubbery. It's fine for a small sample, but not something I really feel like spending 26€ euro per kilo on. 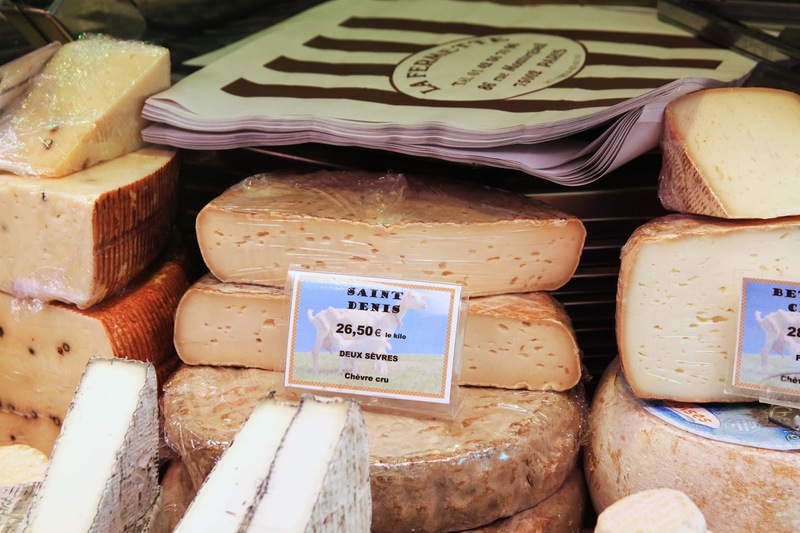 The area where it's made -- the Poitou-Charente portion of the Aquitaine-Limousin-Poitou-Charente region -- is known for fabulous goat cheeses. I have to say, I am a huge fan of chevres from this area. But not of this particular chevre. I love the cheeses that are younger, creamier, and oozier. Though I will admit this would make a nice grilled cheese sandwich. A cheese called Saint Denis for a relic housed in Saint Denys. It's a match made (almost) in heaven and fits like a glove, or at least a shirt. P.S. I realize it's been a while since I posted something. This has been a real doozy of a late summer and back-to-school season!